A lot of you may be enjoying the pumpkin spice everything craze so much that you would drown yourself in it. My husband is one of those people. Mike would go for this madness year-round if he could. Our house smells like pumpkin spice; his car does, too. I’m surprised his skin hasn’t turned a pumpkin orange by now! Maybe not that extreme, but he does consume pumpkin spice whatever on the regular until it’s officially over. As for myself, I never really had a 100% love for pumpkin spice, but I do like it, especially the smell. I’m more of an apple cinnamon kinda gal. It makes me believe that my sometimes dissatisfaction with pumpkin flavor has contributed to my not-being-100%-crazy-for pumpkin spice everything. BUT if pumpkin pie is brought up a notch, like being a cheesecake instead, yeah, I’ll drown myself in it! I honestly cannot remember where this recipe had come from. Maybe from my mom, or she got it from someone else, but this is one of those pumpkin recipes that I enjoy way more than traditional pumpkin pie. This is a great dessert for all your fall gatherings, especially Thanksgiving, and year-round, too. I think the next time I make this I’m going to double the recipe to make it thicker, or use a smaller baking dish. Doing so may require time adjustments to the baking, so if you do use a smaller dish, keep an eye on it so you don’t dry it out or burn it! And don’t forget the Cool Whip or whipped cream! Preheat oven to 325 degrees and spray the bottom and side of 8-inch spring form pan or pie plate. 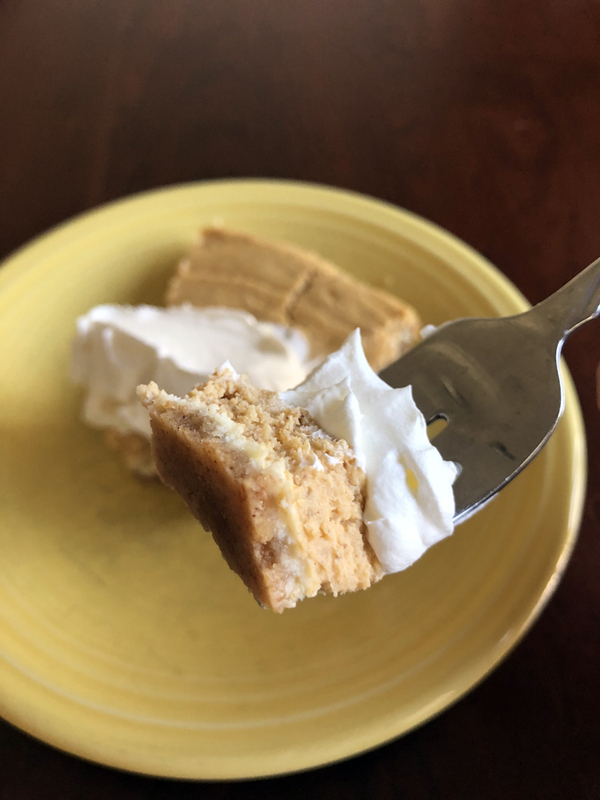 Crush graham crackers and pour into a small or medium bowl; melt margarine and mix in with graham cracker crumbs until crumbs are completely moistened. Pour crumb mixture into prepared pan and press gently to completely cover the bottom of the pan to its sides. In a large mixing bowl, combine softened cream cheese, sugar and vanilla. Add in the eggs; do not over mix! Remove half of the batter to another large bowl, and add the canned pumpkin and spices. Pour the cream cheese batter into the prepared pan first; spread to sides. Then pour the pumpkin batter over top; spread to sides. Bake for 35-40 minutes until the center is set. Place a toothpick in the center of the cheesecake. If toothpick comes out clean, it is set. If not, place the cheesecake back in the oven for another 5 minutes. 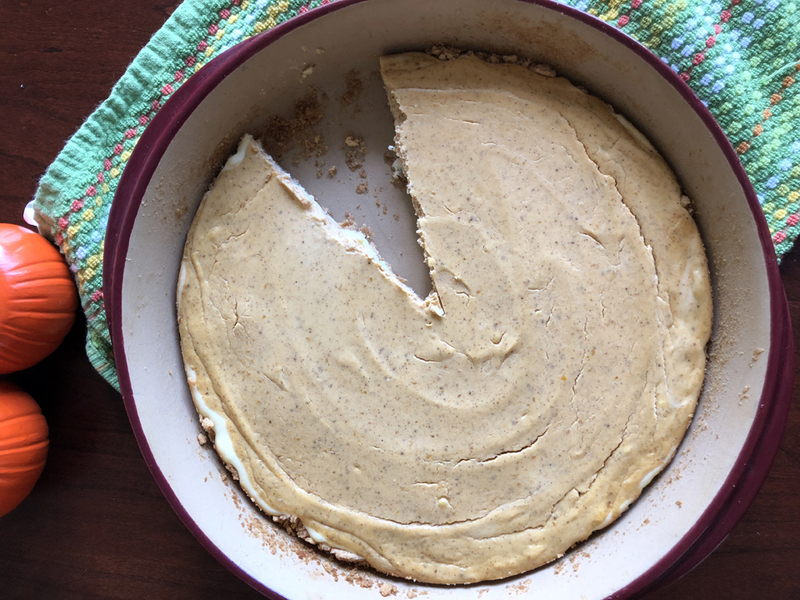 Cool cheesecake and refrigerate for 3 hours or overnight until ready to serve. Use Cool Whip or whipped cream for topping.